Part of the show Diving into Naked Oceans! Some of the fastest changes due to warming seas are taking place in the Southern Ocean. David Barnes from the British Antarctic Survey tells us about studying in the coldest place on the planet and we meet some amazing critters that have come a long way from home. David - I think most people know that Antarctica is the coldest place on Earth, but what they don't realise is that it's the driest, the windiest, and the highest place on Earth, and all of these are very important to the biology. It has no invasive species, so no species that aren't supposed to be there in the sea. Its native fauna - the animals that have always lived there - occur nowhere else on Earth. They are incredibly sensitive to some things like temperature change and this is one of the fastest changing parts on the planet, and one of the parts of the planet that affects most others because, of course, ice turns into water that raises sea level. We can look back at the way that planet has responded to changes in the past and that record is preserved in the animals there. So, that's why we go south to look at many of the animals and what they can tell us about our planet. Sarah - So what sort of changes have you seen already out in the field from the results that you've got? David - I've been going down to Antarctica now since about 1990 and in that time, there have been some really profound changes - particularly in the Bellingshausen Sea which is around the Antarctic peninsula. There, it's got quite a lot warmer only in the surface layers, but it's made a big difference: a degree of temperature there doesn't sound much here, but you remember that in the last 4 ½ million years, the annual temperature variability is about 3 degrees. Now that seems tiny when we might get that sort of temperature variation in a month around the UK. So, big temperature changes on land and in the sea, a lot of sea ice has been lost around the Bellingshausen Sea as well and that's important for several things. When the sea changes from white to blue, it absorbs a lot more heat and that means that our planet is warming up and an astronaut on a space station would see that change dramatically. That means that there's a lot more sea open and getting a lot more light so phytoplankton is making a lot more food. That helps us because that's taking carbon dioxide out of the air and into the water and perhaps sequestering it down to the sea bed, getting rid of it. So how's the biology reacting to all this? Well, more food means that there are new possibilities for some animals but also because the sea ice is retreating further south, animals, too, are retreating further south so we're seeing range shifts in where organisms occur. Sarah - ...So we're just heading into the cold room now. We've got to put on some lab coats, not just to keep us warm but to stop all of our external stuff getting all over your precious samples. Is that right? David - Yes, that's right and we're going to tread on a mat that's going to kill anything on our feet when we walk in to this sealed aquarium facility. Sarah - Gosh! It really is quite cold in here. We've got about 10 tanks absolutely choc-full of things, we've got star fish, anemones... Why bring them back at all? I mean, it seems like a lot of effort. David - Yes, it is a lot of effort and it's very costly in time and expense. But there's lots of work we can do here, particularly with respect to genetics and the physiology - looking at the detailed measurements. We need carefully controlled experimental facilities that we have in labs here. One of the things that we've been doing with some of the animals here is that we've been manipulating the acidity of the water, which is projected to change a lot over the next 100 years, just by tiny amounts and seeing whether that fundamentally alters their ability to build skeletons, and to maintain their skeletons. It's more tricky building and maintaining a skeleton in Antarctic waters. Changing the acidity there by a tiny amount will make a bigger difference than elsewhere so we can manipulate those changes that are likely to happen in tens of years, in months here. And these are our model organisms that we have been very carefully making tiny, tiny changes to, and looking at the response that they give. Sarah - Oh my God! 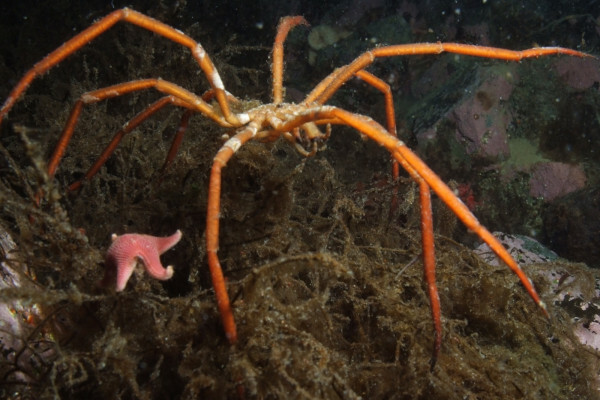 That sea spider is huge. It's almost the size of a dinner plate. That is massive. David - This very cold water holds a lot of oxygen so some animals can reach gigantic sizes. If we look into this aquarium here, we can see two sea spiders that are the size of my outstretched palm and that's because these raised oxygen levels mean that it's much easier to get oxygen to their tissues. Sea lice and comb jellies also reach gigantic sizes in polar waters. Sarah - ...So David, what do you think are the changes that we are likely to see in Antarctica in the future? David - I think we're going to see areas like the Scotia Sea and the Bellingshausen Sea getting much warmer. We're going to see more sea ice loses and so even more heat being absorbed by blue ocean. There's going to be a lot of phytoplankton production. We're going to see collapse of ice shelves which is going to be dramatic because they tend to happen very quickly, exposing large areas of sea bed that we have never seen that will gain whole new communities of life that will take down carbon. We're also going to see dramatic changes in the acidity that might fundamentally affect whether organisms are able to maintain skeletons or not. Things like that could really re-shape the planet. Our problem is knowing how fast these things are going to happen. With many of these we've been surprised even at the pace of things in the last 10 years: typically, things are happening faster than we thought they would. Sarah - And what do you think that the changes in Antarctica can tell us and will mean for the ocean system and global climate system as a whole? David - Because it's got the most unstable large ice masses, global sea level rise will be dictated by what goes on in Antarctica, but it also drives the world's ocean circulation system: the thermohaline circulation system. Sinking water masses, the rate of sinking, and the rate of outflow from Antarctica, distributes oxygen and ocean current speeds and direction around the planet. Small changes in the oceanography there have a big deal of difference in the Atlantic and the Pacific. The way that biology responds there is going to be our early warning system on the way that life is going to respond elsewhere. In Antarctica, things are changing faster but also, because life is more sensitive there, it's giving us a state of things to come elsewhere. It will be a problem to some biodiversity; it won't to others. There will be winners and losers but I think we will be the biggest losers out of climate change. Most people and most industry live on the coast. We're going to lose a lot of coastal land and of course, deserts are expanding very quickly and the water table going down dramatically in many places means that we're going to face big migration issues. People aren't going to be able to get enough water and they're going to lose their land. Lots of people are going to be very crowded for very little resources. So yes, climate change is a big issue for us and Antarctica is going to shape our future. Sarah - So clearly, there are many extremely important changes happening already in Antarctica with big implications for the rest of the world. David Barnes et al (2009). David Barnes & Lloyd Peck (2008).